Foam blank, 1/8'' redwood stringer, laminated pigment, pin-lines, finbox, L/h legrope plug. Natural Flow - blue-yellow script forward of sweet spot along the stringer. Natural Flow and Surf Design, Shoalhaven Heads - black text along stringer, image below. Natural Flow (x2, one flopped) - black script along stringer at sweet-spot. 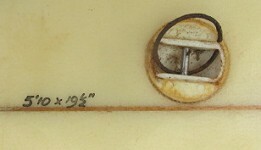 Surf Design, Shoalhaven Heads - black text along stringer, see below. 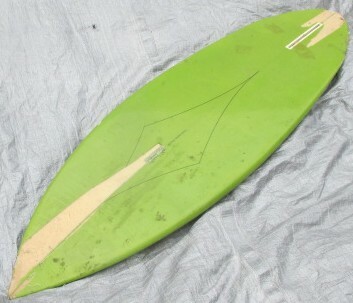 Deck: 5'10'' x 19 1/2'' - pencil along the stringer at the tail. Deck: Clear with green pigment laminated rail lap, black pin-lines. Bottom: Green laminated pigment, black diamond pin-lines at sweet-spot. Dimensions and photographs March 2015. 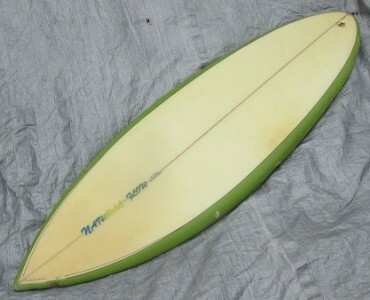 A stock rounded pintail of the late-1970s.